Great movie option, coming to a theatre near YOU! We are so fortunate that we have a local theatre that supports a wide genre of movies! 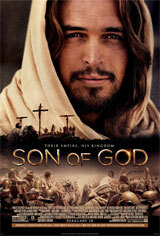 If you have a chance, go and see Son of God this week at the Rialto Theatre in Poky. It is there from tonight (Sunday) through this coming Thursday, May 1st, and show times are at 7:00 each evening. Oh, and be sure to thank the Rialto Staff for getting movies like this! This is the type of spiritual entertainment that we need to support! Son of God is about the life story of Jesus Christ (Diogo Morgado), as he travels and assembles his disciples and performs miracles wherever he goes. Although he becomes beloved by thousands of followers and is greeted warmly where he goes, he also faces detractors, who criticize him for healing on the Sabbath and twist his words to make it seem that he is working against the temple. They worry that he has too much power with the people and force the Romans to find and arrest him. One of his disciples, Judas, betrays him and leads them straight to Jesus. When asked if he is the Son of God, Jesus admits it and is charged with blasphemy. Judas later regrets what he’s done, but it’s too late for him to turn things around. Thank you, Father, for a love so great that you were willing to die on the cross for us! You defeated even death, and promise that you will never leave us or forsake us. God is good – – ALL the time! Maundy Thursday? What’s that all about? It’s also known as Holy Thursday, Covenant Thursday, Great and Holy Thursday, Sheer Thursday and Thursday of Mysteries! Whew. . .but what exactly is this important day in the holy week? Check out the video to learn more as we enter Holy Week….remembering the sacrifice Jesus made for each one of us! Hope to see you at our service this Thursday at 7:00 in Fellowship Hall!